Happy Spring Everyone.... Spring has officially Sprung. Since I have not finished my faux leather skirt project, I thought I'd share what I am wearing today to celebrate the 1st day of Spring. This dress is coined the Carolyn Dress made in 2010. The name came to be when Carolyn had notified me of argyle fabric on sale at Fabric.com. She is such an enabler and I was so tempted, but didn't buy any fabric and instead went through my stash & pulled out this grey/pink fabric, work it up and rightfully named it. I love my wrap dresses dearly, but since I've become a cardigan fanatic, the ties are a nuisance when worn with a cardigan. So a minor change was made to the dress by removing the waist ties. I cut off the waist ties at the skirt edge, leaving a smidge to fold to the inside and stitched down, also had to hand stitch the buttonhole closed that the inside waist tie fed through. For closures I used pink snaps that I'd purchased some time ago from Virgo fabrics, Bklyn, NY. So Good-bye Winter and Hello Spring. There are a few more old wrap dresses that I plan to tweak for the sake of cardigans...lol. With Spring officially sprung, I need to get my sewing projects in order. Of course, dresses will be at the top of my list. Do you have your Spring sewing list ready and what will be your top of the list projects. OMG!!! I love this dress! Argyle prints are so classic. One of my all time fave prints! Werk it! You are toooo much! 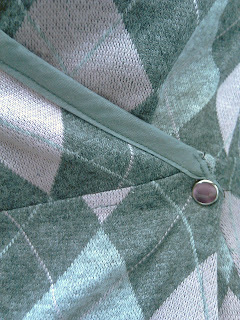 I'd forgotten about that argyle dress and buying the fabric from fabric.com. Glad you were able to make it work! I love your solution for wearing wrap dresses with cardis, because I've had that same problem. Cute dress! Nice job on fixing your dress. WRAP DRESSES! That's what I'm adding to my sewing que this year. I must be the only sewer who does not own one! Beautiful dress Sheila! You are so ready for Spring! The dress/you are gorgeous. I love how your revamp the look of the wrap dress, wonderful! Wow ! I know I'm late here but your blog is looking so pretty and professional. I love the dress and the fit. Have always loved grey and pink. Perfect. Your blog is the best ! I love your argyle wrap dress with that cardigan. Such a classic look!